Everyone loves smoothies. Well, almost everyone. I like to drink them after a run, or on any day that's overwhelmingly hot and humid. They are refreshing, and better than eating fruit and yogurt alone. There is also so many ways to make them. You've probably seen Yoplait yogurts. Unbeknownst to me, Yoplait also offers frozen smoothie packets. Each packet contains enough fruit for 2 servings and delivers 50% of the recommended daily value of calcium. 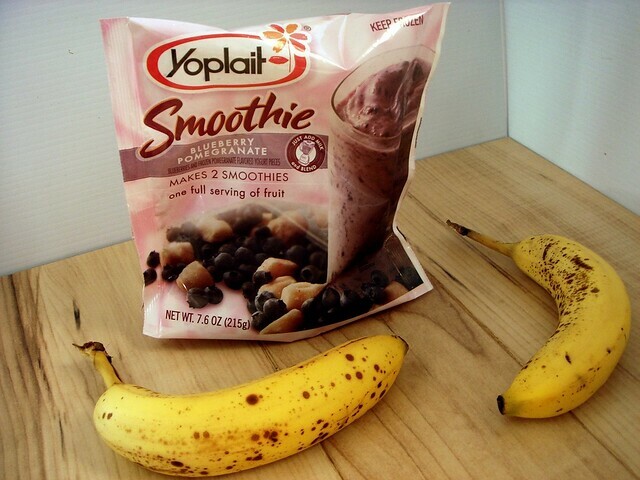 Thanks to MyBlogSpark and Yoplait, I received a coupon to try the smoothies for myself. I was supposed to review the new Chocolate+Banana flavor, but I wasn't able to locate it at the store. Each pack retails for $3.59 and can be found at in the frozen fruit aisle in your grocery store. Since chocolate+banana wasn't available, I got the Blueberry+Pomegranate. 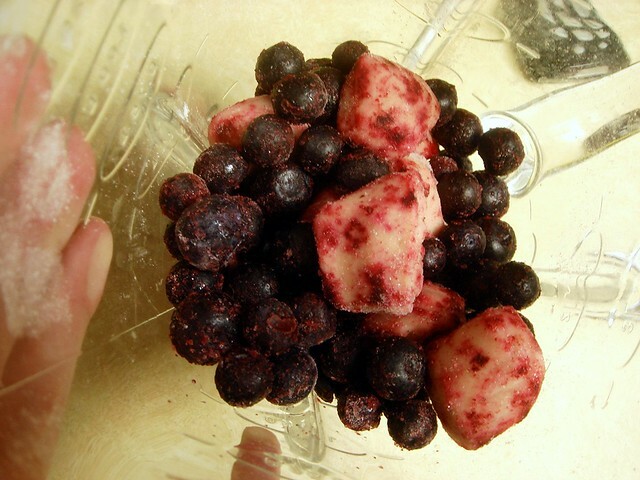 The packet contains mostly blueberries, and pomegranate juice concentrate-flavored yogurt cubes. Each drink totals out to around 150 calories per 8 ounces when made with skim milk, but I used whole because skim milk is disgusting. It came out really thick this way, so I had to add a little more milk. The smoothie was good, but tasted a little on the sweet side. I was surprised, since the nutrition label stated that each serving has 12 grams of sugar. That's really not bad at all for a commercial smoothie. Perhaps it was the whole milk? Who knows. The texture was good, but separates when left to stand for a little. Flavor-wise, though, it was good and didn't just taste like blueberries. If you'd like to try Yoplait Smoothies out, you can print a coupon out for $1 off. Along with a coupon to try out the smoothie, Yoplait has provided a pretty cool prize pack! If you're looking to rest up before the holiday season, this pack will really help you out. Along with a reusable Yoplait Smoothie tumbler, you will get a VIP coupon for a sample of Yoplait Chocolate Banana Smoothie, a neck pillow, and a lavender eye mask. I think I'm going wear the eye mask (which smells great, and lavender supposedly helps you relax - perfect for dealing with morons this upcoming holiday season!) as a headband, and if I come across someone I want to ignore, I'll pull the mask down over my eyes and tell them that nobody's home. Good idea, right?! 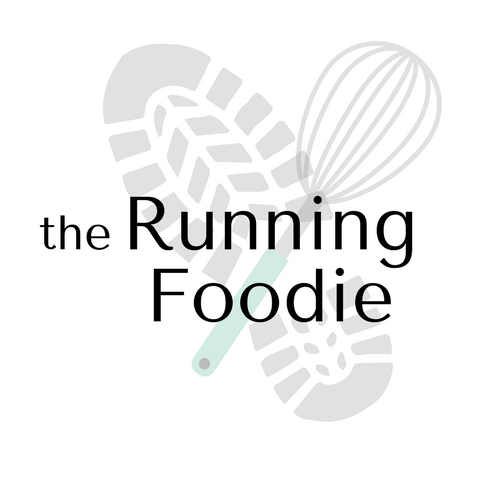 Like She Runs, She Eats on Facebook. Comment again to let me know. Four separate entries to increase your chance to win! Giveaway ends Friday, October 14 at noon, and is open to US residents only. My favorite smoothie has got to be anything Elvis AKA PB and banana involved in some way! 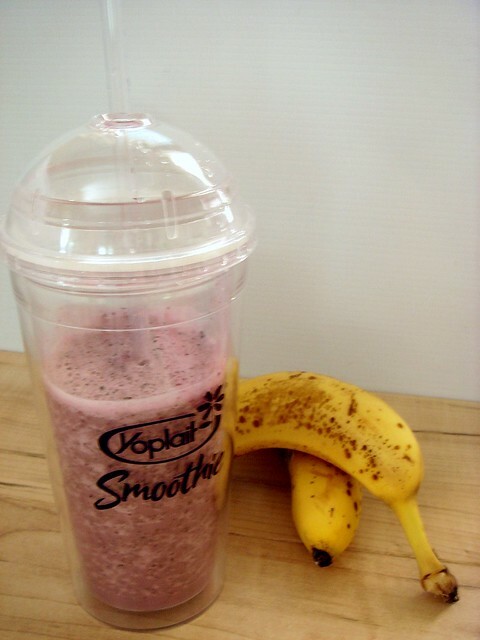 i love strawberry banana smoothies after running! i liked she runs, she eats on facebook. My favorite smoothie is PB and banana. Great after a run! Liked Yoplait Smoothie and Commented on their wall. The strawberry-banana is my favorite,I drink it every day! Sometimes I might add extra banana. I had some dental work done about a month ago and this is what I had until my mouth healed. i started drinking smoothies a week ago. My skin improved after 2 days!